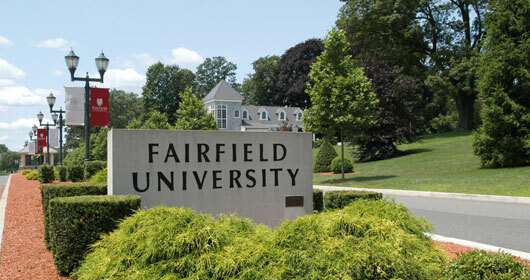 Several Fairfield University students made a major decision regarding their academic future yesterday. Some made a minor one. The academic choices came during the first official Fairfield University Majors/Minors Information Fair that took place in the Oak Room yesterday afternoon. Students of all grades were invited to walk around the room from 11 a.m. to 3 p.m., stop by the different tables that were set up by various departments and learn about the various majors and minors offered as part of Fairfield’s undergraduate curriculum. While the event was cosponsored by several different academic organizations around campus including Undergraduate Academic Planning, Exploratory Academic Advising and FUSA, the people working the actual event were primarily administrators, students involved in the New Student Leaders program and professors from the various academic departments. One of the administrators helping to coordinate the event was Suzanne Solensky, the Director of Undergraduate Academic Planning. One of the most notable features of the fair was the fact that the university’s Registrar Office had a table set up where students could not only ask questions regarding core requirements and recommended classes, but could also sign up for their desired major and/or minor on the spot. “We thought it would be convenient to take one more step out of the process,” said Jessica York, the Director of Exploratory Academic Advising and one of the administrators helping to answer student’s questions. Several students, such as Grace Janizewski, a Theatre major who was working at the Theatre table, thought this event was beneficial to students, especially those who are undecided or unsure of what academic path they want to pursue. Janizewski described an experience she had with an underclassmen student who happened to wander by and eventually stop at her table. The student was a Management major in the business school who, upon learning more about the Theatre department, decided that he wanted to add a minor in Theatre. While this is not the first time the university has hosted an event purposed to educate students about the various majors and minors offered at Fairfield, this was the first year that all major and minor options, regardless of their specific college affiliation, were represented at the same event. According to Solensky, this new event came about for two main reasons. The first is that an event which had typically been held every October called “Core Unmasked”, which gave undergraduate students information about the core curriculum and different academic departments, was unable to be held this year due to lack of funding. The second is that administrators thought it would be a good idea to take each of the various major/minor informational fairs that are hosted by each individual college within the university and consolidate them into one event. Solensky explained that this new all-encompassing Majors/Minors fair is almost entirely built off of the largest informational fair held at the university, the one for the college of Arts and Sciences, which is typically held every spring. As students left the information fair, they were encouraged to fill out a survey about their experience and what they would recommend to improve it.